For those of you (us) who feel like you are constantly beating up against the "what has been", "what always worked", "the way we've always done it", or "we don't do things like that around here", the words below will be a breath of fresh air. The farther down the road my journey takes me, the more I see that that which is fresh, new, inspired, pushing the edges, causing people to think/re-think, making people a bit uncomfortable is that which the Lord uses to cause productive change. 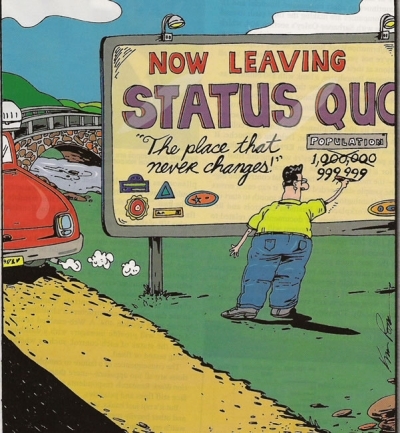 Status quo leadership or thinking is only going to lead to more "status quo". I've often wondered what the Jesus movement of the first few centuries of the early "ekklesia" would have looked like if everyone simply accepted the status quo. Fact is, the resurrection essentially condemns the status quo…"behold, I am making all things new", says the Lord. When God does new things, people's lives and history changes. As Seth says below, there is no "Tribe of Normal"…believe me, those words are prophetic! People don't coalesce into active and committed tribes around the status quo. The only vibrant tribes in our communities are the ones closer the edges, or those trying to make change. The center is large, but it's not connected. If you're trying to build a tribe, a community or a movement, and you want it to be safe and beyond reproach at the same time, you will fail. Heretical thoughts, delivered in a way that capture the attention of the minority–that's the path that works.